A tough 6mm wire frame with 4mm mesh make the body tough! Damp towels on the floor? Shampoo bottles laying around? Not with the ESS bunk bed basket! 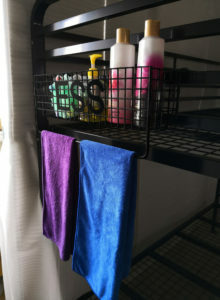 The addition of this bunk bed storage basket to the Dallas bunk bed is ideal for keeping the place tidy and damp towels hung to dry. 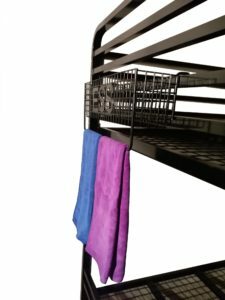 Two of these bunk bed baskets will fit on each end of the Dallas double bunk bed or 3 to 4 on the Dallas D3 triple tier bunk bed. Easy fit no tools required, just hook onto the end of your Dallas bunk bed or any metal bunk bed that the hooks will fit. DAMP TOWELS ON THE FLOOR? NOT NO MORE!